Autonomous Equipment in Construction: Anytime Soon? If you're a fan of both vehicles and Disney movies, then odds are good that you've seen the original, the remake, or possibly both versions of The Love Bug. In this movie, Herbie, the loveable little VW wins races, patches up fractured romances, foils criminal plots, stays spotless, and apparently needs no fuel of any kind. And best of all, he can drive (and presumably parallel park) himself. Audiences at least enjoyed the movie's fantasy of an automated car, but nearly fifty years after the film's initial release, self-driving cars are on the horizon, and in everyone's future. Automotive experts think by the time Love Bug III debuts in the mid- 21st century, almost all drivers will be transported by completely automated autos. So what does this mean for the construction industry, no stranger to using vehicles for work? Will Herbie soon be a fixture at sites? Actually, in some ways he's already here. "Self-propelled" road stripers have been marking lanes for several years. Chugging down the road at a nose-bleed inducing speed of ten miles an hour, this machine can be programmed to produce thirty-five varieties of stripe, saving human workers from tedium, fatigue, and being struck by other vehicles. This road worker has an automated vehicle colleague who is operated drone-style by a human outside of the vehicle. Currently, this type of vehicle is employed by the state of Florida, moving and positioning crash barriers. Construction equipment developer Komatsu unveiled a line of four "automated" bulldozers and one excavator in 2013 that could be operated on site with minimal human guidance and skill. And this summer, the company announced the debut of its SmartConstruction company. Its goal is to have a much more automated pre-foundation work site, with Komatsu drones working in conjunction with equipment like laser scanners and stereo cameras, to complete surveys of sites, then compile it into data automated construction equipment can use. 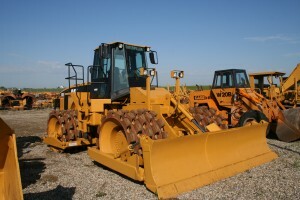 Komatsu construction equipment company anticipates that the only humans needed on site at this stage would be the ones supervising the machines’ work. Such services save money, improve safety, and compensate for ongoing worker shortages. So does this mean that Herbie will soon be a co-worker or maybe even a supervisor at a site soon? Not quite, say experts, but it does mean that construction management should be preparing now for more staff training, more off-site supervision, and budgeting for more high-tech automated construction equipment, or risk being left behind professionally.